Jane Hayes has lived for Pride and Prejudice and it has become a thing of dreams from the moment Colin Firth came into the picture. Thanks to an unexpected addition in her Great-Aunt’s “Will” Jane will have the chance to live the life she always wanted. 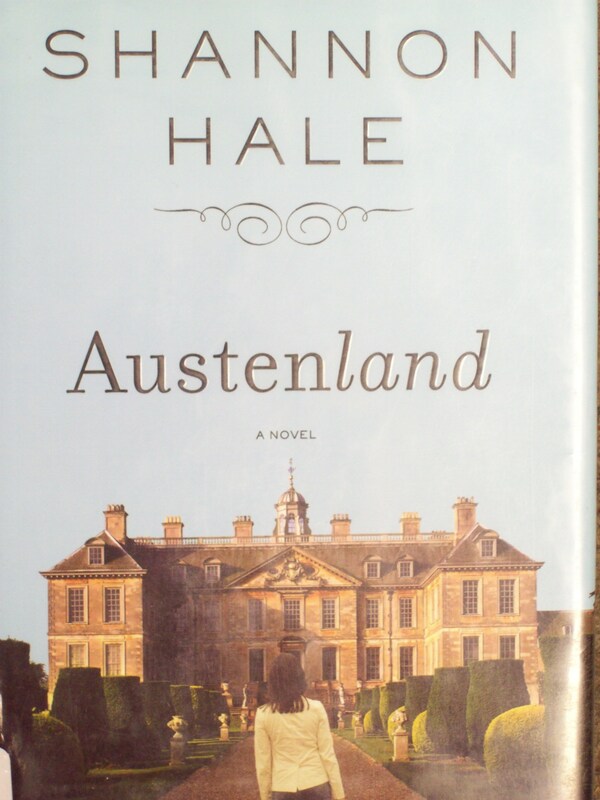 Austenland by Shannon Hale is exactly what I imagined, a little quirky and filled with women who want to life the Jane Austen experience. This was the perfect book to read for the Jane Austen fan. It was only 195 pages so I went through it pretty fast but enjoyed every page. There are little surprises throughout the book especially with who some of these people really are in their own lives. I liked that Jane grew up through the book and knew she had to take charge and live her life. The part at the end with Mrs. Wattlesbrook’s and Jane was priceless and perfect. There were times that it got confusing who was good for Jane and who wasn’t. It was a tug between Martin and Nobley. I couldn’t make up my mind, secretly I was going for Mr. Nobley. The truth will come out in the end and the right man will be paired with Jane. The ending was what you wanted in a happy ending filled with romance and hope of a new beginning. Officer Dare Barron has had a crush of Liza McKnight since he was a fifteen years old. He has been seeing her pop up every time she bails out her brother. He will find himself getting closer as he sets out to protect her. Liza McKnight got used to the police waiting room as she got her brother out on a regular basis. She is very protective of her brother but wants him to get help. She will soon be pulled into more trouble than she can handle and will get her own kind of help with Dare. 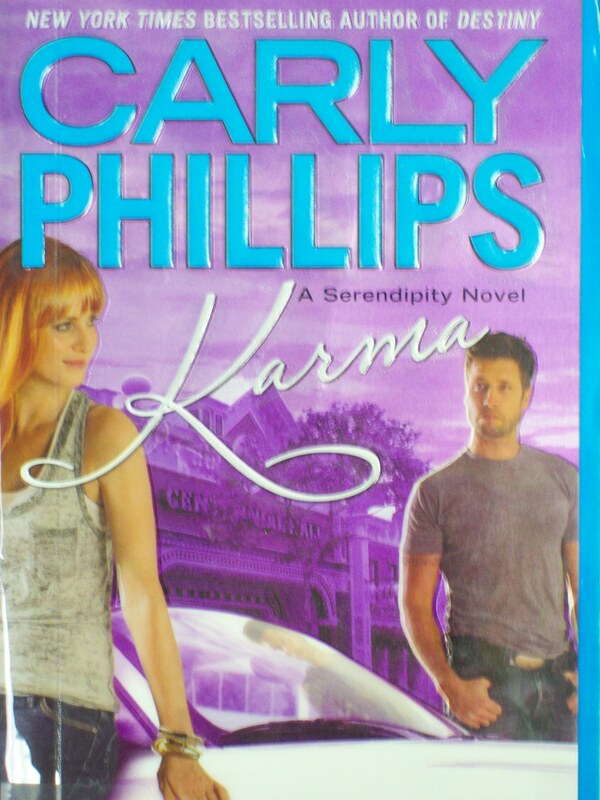 Karma is the third book to the series Serendipity from Carly Phillips. I grabbed the book knowing it was the third book but as I was reading it I felt it was a standalone novel. The brothers connections were not lost in the book and you knew pretty much the history between the brothers whether it was in one sentence or one scene. I could not get into the book in the very beginning but once I got through several more pages I got into the book. The interaction between the brothers was great and makes me want to read their stories. I liked Liza who was the caring one but was finally being taken care of, with the exception of her brother saving her that one time, by Dare. I liked Liza and Dare together. They weren’t instantly in love and it took some time and some trust. The guilt behind the accidental death back when Dare was fifteen comes into play. Phillips tells the story of the accident well and puts in the guilt on both sides. The character Brian, the brother, is not such a bad guy that is once he comes clean and sobers up which is done with some help. Karma will not be the last book I will be be reading from Carly Phillips. Traci Evans did not trust men thanks to her husband who died while cheating on her. Things will start to change when her neighbors adult son start to change her mind. Ryan Gilmore wanted his mothers neighbor but she kept rejecting him. He will start getting her attention and sparks will fly but he will have to convince her that they are good together. Not Even If You Begged was a book I picked up from Francis Ray. This is the fourth book to the series Invincible Women which of course I didn’t know at the time of reading the book. There are some characters like Justine and Brianna and I wonder if their story was before in the series but really this could have been read as a stand alone novel. This was a good book to read with some humor of the women from the club and there were certainly plenty of steamy scenes with the two couples that were part of the book. What I liked about the book was that it was uplifting for these women to find love. For Traci it was to find love in the first place and for Maureen who finds it again. I liked that both these women were the focal point, Traci perhaps a little more. It could have been told with just one of the characters but with the two of them it gave a little more. I liked Traci’s spitfire attitude but she leaves her heart out of relationships after being with Dante. It takes Ryan, a younger man, to get her to love again and to trust a man again. The story turns when a stalker is brought into the situation which is a little scary with how crazy she appears in the book. Maureen was a women who had loved but was finding it again with a man, Simon, who was ten years younger. The book was written realistically I thought with the problems these women felt who had loved and lost, and how they started to try again by living their lives. Griffin Reid was back in his hometown once again for his sisters wedding. He will soon find himself staring at his sisters best friend Katie. He knew she was off limit but he went for it. It was supposed to be a one night stand but soon he will find he can’t stop thinking about her. Kate Evans is a second grade teacher in her hometown. She has the chance to leave home for a year but can’t seem to accept because of fear with leaving her family alone. Kate will soon find another thing stopping her when she sees her childhood crush Griffin is back and her feelings have never changed. 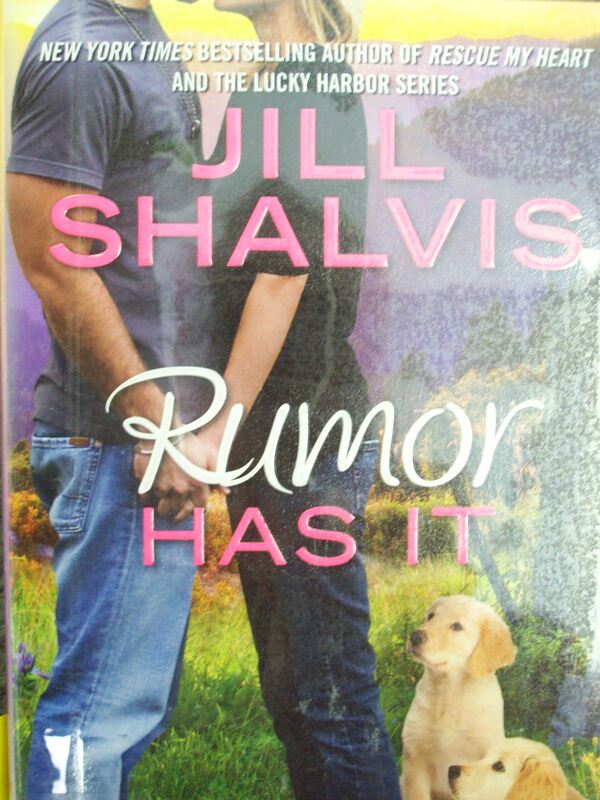 Rumor Has It is the fourth book to Jill Shalvis’s series Animal Magnetism. The nice thing about these books are you can read them easily on their own. A little background is given and you wouldn’t get lost if you just picked up the book. Out of all four books that I have read I have to say I really like this one. They were all good but there was something about Kate and Griffin that had me wanting to read more and more. Kate had a unique situation with taking care of her family which she used as an excuse for not leaving. I liked that she grew stronger in the book and took charge even though it was not easy. Griffin was a war hero and it felt he was in a rut the entire book that is when he wasn’t with Kate. They each fought the attraction but could not keep apart especially as they each took that first step forward. There is a little surprise that happens at the end that causes a little turmoil but Shalvis makes sure that the situation does not cause permanent damage. There is a perfect happy ending that left me smiling for Kate and Griffin. There is a girl named Olivia in the book that is mentioned. I wonder if she will be the next one in the series or if Jill Shalvis will end it with the fourth book? Only time will tell but I will keep looking out for book from Shalvis maybe trying out another series other than Lucky Harbor series. Genevieve McInnis is no longer the woman she was when she left a year ago. She will find salvation as she will be freed by another clan but it will not be easy to get away. She will be kept there by Bowen who will give her a chance to have a normal life than the one she had been given the past year. Bowen Montgomery came to the opposing clan expecting a fight but most men have fled along with their leader. He will help the ones that were left behind but will mostly concentrate on Genevieve who needs to have a champion after all that has happened. Highlander Most Wanted is the second book to Montgomerys and Armstrongs. Maya Banks follows up right after the first book with Genevieve and Bowen’s characters meeting at McHugh’s land where Ian is dead and Patrick has fled. As a sequel this was a great follow up story. As before I was pulled into the story, perhaps not as fast but still quickly enough and I stayed entertained throughout the book. Genevieve was one who had a brutal past year as she was taken against her will and was used by Ian over and over. No one dared stopped the treatment but the torment stops when Ian is killed. There is a surprise that shows she was part of Eveline abduction but things are explained and she is not the villain. Although from all that you learned there was little doubt she was a villain for even a second. Now with all the ill treatment you will smile when she discovers true happiness in the arms of Bowen. Bowen seems like a harden warrior but he falls hard for Genevieve the moment he sees her, scar and all. I liked that when he found out the news at what she had done there was not complete judgement. He looked at the situation and then asked the rest of the story from her. The villain is Patrick who ran away in the beginning but he wouldn’t be forgotten. The other villains of the book are his clan members who shunned Genevieve as a person but all will be rectified at the end. A complete happy ending did not happen right away but at the very end of the book Genevieve and Bowen would have that perfect ending they deserved. Can’t wait to read the next book. It will be with Brodie and Taliesan unfortunately it wouldn’t be out until November which is a long time away but there are always more books to read.